The best-loved car in Fiat's history, the icon that made Italians into car-owners, and worldwide ambassador for the country, celebrates its 60th birthday today with a special event that honours its history and the style and design that made it famous across the globe. Not by chance, it is joining the permanent collection of the MoMA, the Museum of Modern Art, in New York. "While the Fiat 500 has unquestionably left its mark on automotive history, it is equally true that it has never been just a car", said Olivier François, Head of Fiat Brand and Chief Marketing Officer FCA. "In its 60 years of history, the 500 has transcended its material manifestation to enter the collective imagination and become an icon, which has now the honour of being certified by being acquired by MoMA in a tribute to its artistic and cultural value". 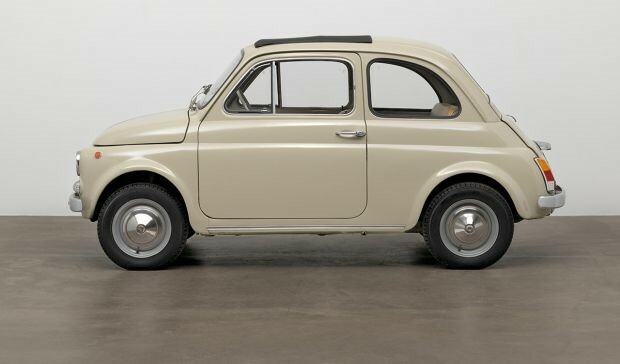 "The Fiat 500 is an icon of automotive history that fundamentally altered car design and production" said Martino Stierli, The Philip Johnson Chief Curator of Architecture and Design at MoMA. "Adding this unpretentious masterpiece to our collection will allow us to broaden the story of automotive design as told by the Museum"
The model acquired by MoMA will be a 500 F series, the most popular 500 ever, made from 1965 to 1972. Fiat's "great little car" was an instant success worldwide, and the 18 HP of its 499.5 cm3 engine gave it a top speed of 95 km/h. Over 4,000,000 units were made from 1957 to 1975. From the New 500 in the late 50s, on to the Sport and then the D, both more powerful, followed by the F, which holds the record for the number produced, through to the more comfortable L, and finally the R.
The Fiat 500 is not just a symbol of mass car ownership. Over time, it has become a style and design icon. Unmistakable design has inspired the imagination of artists, who have responded with elegant, exclusive and sporty interpretations. It has achieved the feat of maintaining its identity while remaining youthful over 60 years of history and lifestyles, fashion and society. A successful car, but also a cultural phenomenon in centre stage for 60 years, never going out of fashion. With the launch of the new generation in 2007, the 500 appeared in a variety of original and cool interpretations, both hatchback and convertible, with an array of extraordinarily successful special editions (such as the 500 by Diesel, the 500 Gucci and the 500 Riva). Success is reasserted by numbers: the Fiat 500 is the best-seller in Europe, ranking first in eight countries and among the first three in six others. The 2007 version won over 2,000,000 motorists in just 10 years and has reaped accolade after accolade since its debut, including Car of the Year and the Compasso d'oro design award. The 500 is the symbol of Italian creativity which has always inspired artists and designers worldwide becoming an icon of beauty and art. Today, it makes another step forward becoming a work of art in its own right by the side of the other great icons of Italian design and yet again remaining "Forever Young".